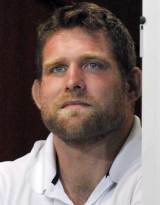 Prop Debaty took his bow on the club scene for Belgian club Stade Rochelais in 2001 before making the switch across to French side Perpignan in 2002. Having made 77 apperances between 2002 and 2007, Debaty signed for Agen. After lasting just a year at Agen, Debaty signed for Top 14 giants Clermont Auvergne and has made over 75 apperances for the 2010 Top 14 champions. Debaty has made just one appearance for the French national side to date - against Romania back in 2006 - but following a series of storming performances for Clermont, he earned a recall to the French side ahead of the 2012 Six Nations in Philippe Saint-Andre's first squad as coach.